No matter the ability, or skill level, no recreational skier enjoys skiing on ice. Snowboarders find it even harder. So: dealing with it. It’s simple enough in concept – it mainly requires the ability to be confident in the correct movements. However, confidence cannot be taught, as it is gained over the experience of attempting and achieving control. And that means skiing on even more ice to practise! Improving your confidence can start from having sharp edges. This part of the ski is made from metal and is designed to cut through ice, provided pressure is applied in the correct way, and that they are sharpened. If it has been a long time since your skis have been serviced, then you will struggle to find grip as the edges will be rounded. Skis can be serviced at specialist shops in the UK or once in resort, or even with an edging tool, if you have been shown how to do it properly. An aggressive edge angle makes it easier to grip on ice, however they also get blunt more quickly. The majority of skis are set at an 89° angle, and this is perfect for most people. Tactically, you can look ahead to the softer patches of snow between the ice sections, and aim to make the second part of your turn there. If the snow has built up to bumps at that point, aim to make the same type of turn, but absorb the mogul at the end of the turn by bending the knees, and this will also lower your speed as you connect with the soft snow. The psychological and technical factors of skiing on ice are heavily interlinked as you get a better technique with greater confidence. It’s important that you are positive in the way you approach the ice. Naturally you will back away as soon as you see it. Then the tips of the skis flap, and you only have a small section of edge at the back of the ski to try to grip with, which is almost impossible. If you widen your stance and squat in an effort to feel more stable, this will make you slip further. Another common mistake is to move your shoulders forwards, making your hips drop back. You must have the hips high and then commit to leaning your shins against the front of the boot. It is a bungee jump moment: you have to be assertive or you won’t succeed. If your shins are pressing hard against the front of the boot, the edge at the tip of the ski will connect and grip on the ice. 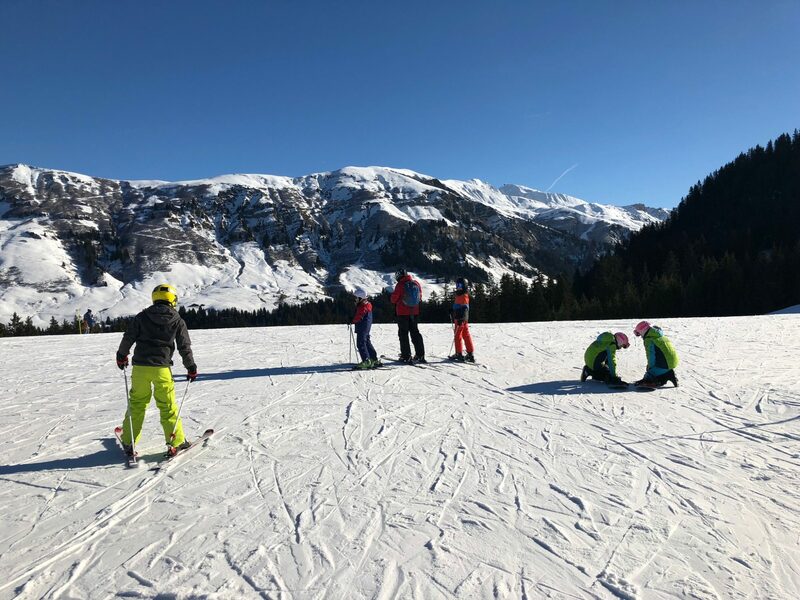 If you approach the ice in this very strong forward position, you have built a platform where you can then stand wholly on your downhill ski, particularly pressing the shin against the boot. Applying pressure to the ski gives even more grip, and can be increased by lowering the downhill shoulder even further down the hill. It must be as if you’re standing between two walls and you can only move your upper body laterally. Skiing on ice starts and ends with the confidence to commit to that strong skier position, and courage to press completely on one ski (the outside). Only once you feel this movement will you understand how the ski can actually grip, and keep you in control. This holiday, have conviction on the ice; you are already sliding, so what have you got to lose? Not Sure If You Should Have Ski Lessons? Consult the Flow Chart Of Truth to Find Out!